The most common CNS mycoses are, in order of frequency, Candidiasis, Aspergillosis, and Cryptococcosis. They are seen mainly in patients with AIDS and other immunosuppressed states. 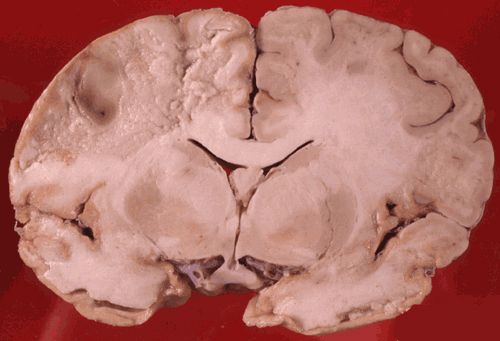 Extensive brain necrosis (more severe in the left hemisphere) in cerebral candidiasis. Disseminated neonatal candidiasis. Multiple microabscesses in the midbrain. Candida is also frequent in the neonatal period. Candida is a commensal but rarely causes disease in normal people. Infection is caused by organisms that are already present in the intestine and other locations, and in neonates it is trasmitted from external sources. Most disseminated infections are nosocomial, and the key risk factors are catheters, and antibiotics. 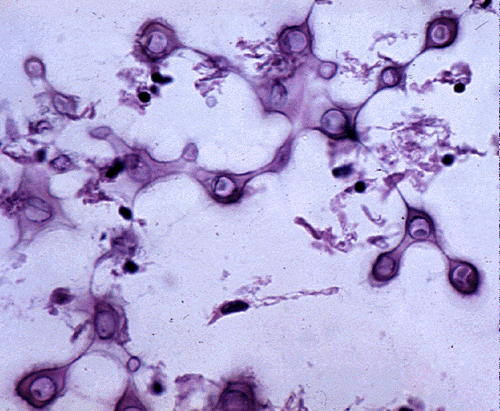 Candida consists of budding yeasts and hyphae. It causes meningitis, multiple microabsesses, or extensive brain necrosis. At first, the inflammation consists of neutrophils; later of epithelioid cells and giant cells. Aspergillosis. 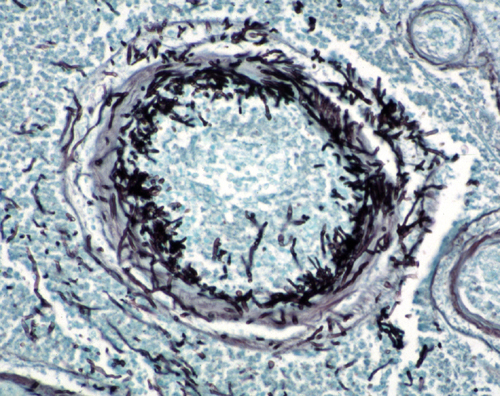 Fungal hyphae invade an artery. 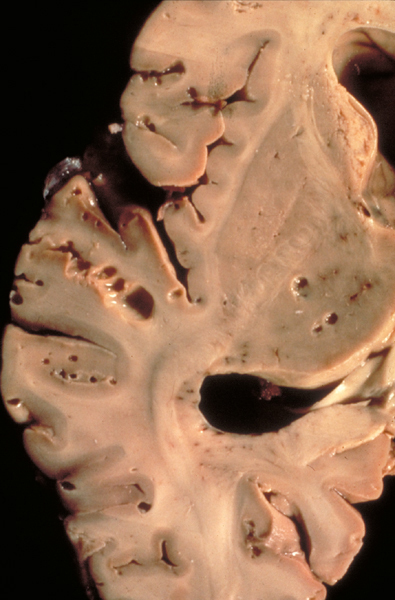 Cerebral mucormycosis in a patient with leukemia. 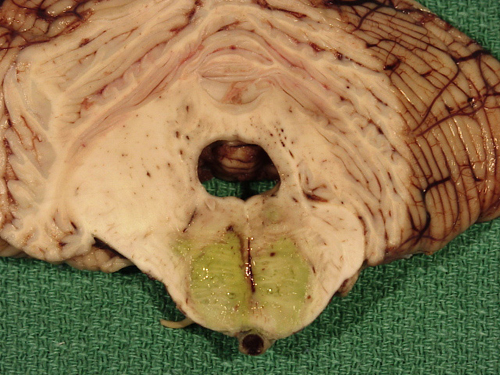 Fungal vaasculitis caused basilar artery thrombosis and infarction of the pons. The patient was jaundiced at the time of death. Aspergillus and the related soil fungus mucor (rhizopus) are branching hyphae. They are ubiquitous in nature but only cause disease in immunosuppressed persons. The most important risk factors for disseminated infection are neutropenia, cytotoxic chemotherapy, and corticosteroids. Aspergillus enters the body through the lungs. Mucor, which is also common in patients with diabetic ketoacidosis, infects the nasal mucosa from where is spreads to the brain. Both fungi have the tendency to invade blood vessels and cause thrombosis with cerebral infarction or vascular rupture with cerebral hemorrhage. The angioinvasive properties of aspergillus are due to the production of elastase by some species of this fungus. Cryptococci in a mucinous background. Cryptococcosis. Accumulation of organisms in the subarachnoid space causes a cystic change. Cryptococcal meningitis. Fungal yeasts in a perivascular space. Cryptcoccus is an oval yeast about the size of a red cell, surrounded by a gelatinous capsule. It is a worldwide fungus, present in bird droppings, vegetables, and soil. It speads to the brain from the lungs and often causes meningitis without involving other organs. It is most often community-acquired. It may affect healthy individuals, but is particularly common in immunodeficient patients. It grows extensively in the subarachnoid space and perivascular spaces, which become cystically distended to the point that brain sections look like Swiss cheese. In immunosuppressed individuals, inflammation is absent or mild. In immunocompetent hosts, cryptococcus elicits a cell-mediated immune reaction with lymphocytes and epithelioid cell granulomas. Cryptococcus meningitis has an insidious onset and may go on from weeks to years. It can cause hydrocephalus, dementia, and focal neurological deficits. The CSF in cryptococcosis shows mononuclear pleocytosis, elevated protein, and low glucose, similar to tuberculous meningitis. Yeasts can be identified by microscopy of the CSF and their antigens can be detected by latex agglutination. 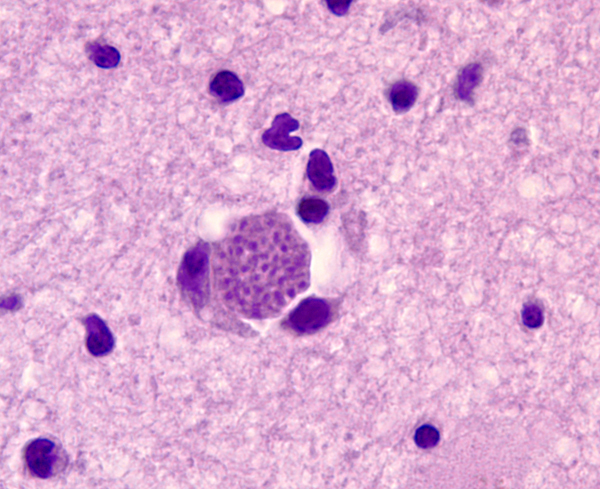 The protozoon Toxoplasma gondii infects approximately one-third of the world’s population. The organism reproduces sexually in the intestinal tract of cats and forms oocysts that are excreted in cats’ feces. Protozoa released form oocysts ingested by animals and humans invade the brain, heart, skeletal muscle, and other organs, where they form tissue cysts. Humans and animals are infected from oocysts in cat feces and from poorly cooked meat containing tissue cysts. Parasites released from oocysts and tissue cysts reside in cell vacuoles and are protected from host defenses. Most primary infections are asymptomatic or cause a self-limited granulomatous lymphadenitis. Latent infections are also silent. If the primary infection occurs during pregnancy, toxoplasma may cross the placenta and cause a devastating necrotizing encephalitis and chorioretinitis in the fetus. The end result of this is severe brain damage, microcephaly, cerebral calcifications, and blindness. Necrotizing encephalitis from reactivation of latent toxoplamosis may also develop in immunosuppressed individuals, such as patients with HIV-AIDS. The lesions contain single organisms and cysts, which can be identified histologically or by immunohistochemistry. 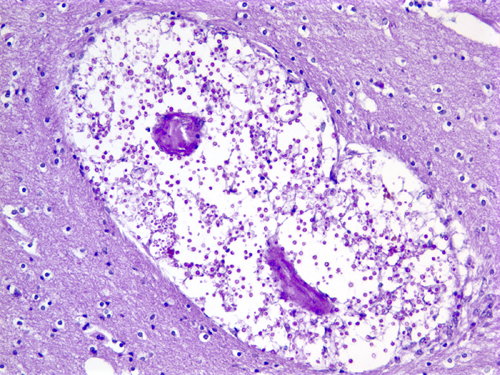 About 25% of patients dying from AIDS have toxoplasma encephalitis.The protozoon Toxoplasma gondii infects approximately one-third of the world’s population. The organism reproduces sexually in the intestinal tract of cats and forms oocysts that are excreted in cats’ feces. Protozoa released form oocysts ingested by animals and humans invade the brain, heart, skeletal muscle, and other organs, where they form tissue cysts. Humans and animals are infected from oocysts in cat feces and from poorly cooked meat containing tissue cysts. Parasites released from oocysts and tissue cysts reside in cell vacuoles and are protected from host defenses. Most primary infections are asymptomatic or cause a self-limited granulomatous lymphadenitis. Latent infections are also silent. If the primary infection occurs during pregnancy, toxoplasma may cross the placenta and cause a devastating necrotizing encephalitis and chorioretinitis in the fetus. The end result of this is severe brain damage, microcephaly, cerebral calcifications, and blindness. Necrotizing encephalitis from reactivation of latent toxoplamosis may also develop in immunosuppressed individuals, such as patients with HIV-AIDS. 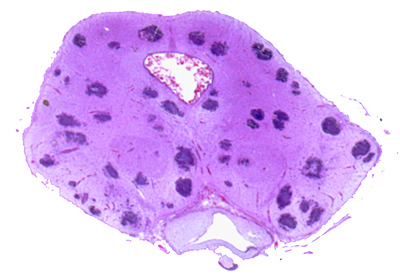 The lesions contain single organisms and cysts, which can be identified histologically or by immunohistochemistry. About 25% of patients dying from AIDS have toxoplasma encephalitis. Recent clinical studies have demonstrated an association between latent CNS T. gondii infection, schizophrenia, and suicide. The presumed mechanism of mental illness is neuroimmunological disturbance stemming from the presence of T. gondii in the brain.